This article was last updated Apr 10, 1019, but some terms and conditions may have changed or are no longer available. For the most accurate and up to date information please consult the terms and conditions found on the issuer website. The BankAmericard® credit card is a good option for people with debt on an existing credit card who are looking for a way out or for someone who is planning to make a large purchase. With this card, you will enjoy a nice introductory period for balance transfers and purchases — 0% Intro APR for 18 billing cycles for any balance transfers made in the first 60 days and 0% Introductory APR on purchases for 18 billing cycles (15.24% - 25.24% Variable APR, after). With proper budgeting, you can save money by paying off your debt during the intro period. This card requires excellent/good credit to qualify, so it’s best for people with a history of using credit responsibly. Since this card requires excellent/good credit, you won’t qualify if your rating is bad or fair. And if you aren’t in the market for a balance transfer or don’t plan on financing a large purchase, this card doesn’t provide much value for you. A card that offers rewards or cash back, like Citi® Double Cash Card – 18 month BT offer, would be a better option. However, if you do plan to transfer a balance or make a large purchase, the intro period is shorter than others, so think carefully about how much time you’ll need to pay off your balance. One notable feature of this card is there is no penalty APR. Therefore, if you pay late, Bank of America won’t automatically raise your interest rate (though you will be charged a late-payment fee). Although this card doesn’t have a rewards program, you will enjoy some additional card benefits, which we cover below. Most balance transfer cards do not come with rewards programs, because they’re primarily used to pay off debt. As a result, this card’s lack of rewards isn’t a major deal breaker, though if you want a balance transfer card with rewards, there are options like the Discover it® Balance Transfer. Free FICO® score: Opt in to receive free access to your FICO® score as well as key factors affecting it, tips to improve it and other information. $0 liability guarantee: Don’t worry about paying for unauthorized charges made on your account. You won’t be responsible. Online chat: Easily talk to a representative via chat by signing on to online banking. Account alerts: Choose from several types of customer email or text alerts and let your phone tell you when payments are due and paid. Text banking: Get texts of certain account information you need quickly. Digital wallet technology: Conveniently pay with the click of a button in-app, online or in store using Apple Pay®, Microsoft™ Wallet, Android Pay™ or Samsung Pay. To benefit the most from this card, be sure to transfer your balance within 60 days from account opening so you don’t miss the intro offer. Once you complete your transfer, make it a point to pay off your balance before the intro period ends. Also, if you plan on financing a large purchase with this card, be aware you will be charged 15.24% - 25.24% Variable APR once the intro period is over. Make your purchase as soon as possible and pay it in full before the end of the intro period to avoid interest. A balance transfer with the BankAmericard® credit card cannot exceed your available credit limit. For example, if you have a $10,000 credit limit, you can’t transfer a balance of $12,000. As stated above, you must complete your transfer within 60 days from account opening to take advantage of the intro offer. To complete your balance transfer online, from your account dashboard select “Transfers” and then select “For credit card balance transfers.” Once you select your account, you should see the intro offer listed. From there, fill in your transfer information and verify and submit your transfer. The transaction can take up to two weeks to process, so continue to make payments on your balance until the transfer is complete. 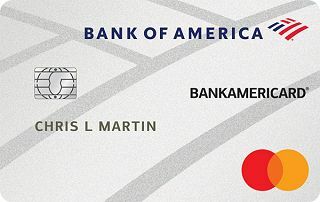 When compared to the Chase Slate® credit card, the BankAmericard® credit card is very similar. Both cards offer the same length of time for the intro period and no annual fee. The biggest difference between the two cards is the ongoing APR once the intro period is over. While the BankAmericard® credit card has a 15.24% - 25.24% Variable APR, the Chase Slate® credit card has 16.49% - 25.24% Variable APR. This isn’t a large difference, but it’s significant enough if you plan to carry a balance once the intro period is over. Therefore, the BankAmericard® credit card may be a better option for you if you want a lower ongoing APR. See below for a breakdown of the key elements of both cards. They also have different balance transfer fees (see below). Balance Transfer Fee Either $10 or 3% of the amount of each transaction, whichever is greater. Intro $0 on transfers made within 60 days of account opening. After that: Either $5 or 5%, whichever is greater. The BankAmericard® credit card is a great option for someone who is looking for a balance transfer offer. This card can save you a good chunk of money if you complete your transfer within 60-day introductory period and pay off your balance before it runs out. Chase Sapphire Preferred Card vs Premier Rewards Gold Card from American Express – Which earns you the most points?